The sunsets and sunrises in this rural, southern part of Holland emanate mystical shades of effervescent pink, a manifestation which has drawn many an artist to these lowlands. And if one were to search all over Holland, it would be difficult to find a place more suitable for a monastery than this patch of land, an unusual expanse in a densely-populated country. The usual markings of Dutch countryside apply here—lush green fields, fat, shiny, black and white cows, tidy brick farm houses with lace in the windows, canals, and undisturbed horizons. It is quiet, green, and fertile, with a faint wisp of the sea in the air. Carefully preserved nature, local tradition, cleanliness, all set the European stage for a comfortable, peaceful life. But what is all that without the grace God? Only a landscape, or a still-life. 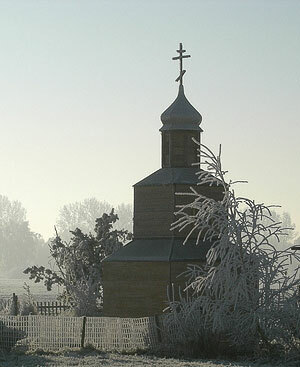 In Asten, however, a roadside chapel in the Russian style, with cupola and eight-pointed cross, stands out against the flat horizon. And the pinkish-purple effervescence radiates somehow not only from the sun, but from the heavens; for in this place there is an Orthodox monastery, dedicated to the Nativity of the Mother of God. 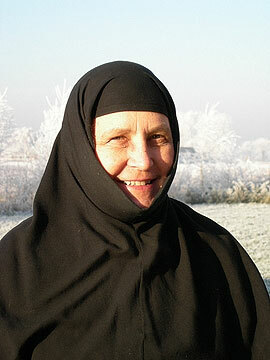 The founder and Abbess of this small community is Mother Maria, who was born in Den Hague. Mother Maria is an edifying example of one who sought and found, asked, and received. The visible result is this convent. Born at the end of the Second World War, a time of great hardship for the Netherlands, Mother Maria describes her upbringing as conducive to a Christian outlook on life. Russian Orthodoxy came to Holland in the 1940’s and 50’s, through this community in The Hague, with the unsuspecting help of the Catholic Church. When the communist revolution swept over Russia, a diaspora formed in Western Europe which was to help introduce the Orthodox Faith to the local people. Christianity in Russia was being replaced by militant atheism, a fact which caused the Catholic Church to begin its fervent prayers for the Christianization of Russia. Mother Maria would enter that convent as a novice three years after her conversion, in 1965. “When I was 21 years old I became a novice in the Hague Monastery. Why? This decision did not come to fruition in a day. I had a longing for monastic life, for Church Services, a growing desire to dedicate myself to a community, to a life of simplicity and prayer. Of course, I read a lot about this, but most important for me were my trips to the Lesna Mother of God Convent in France. I went there during practically every summer vacation. I attended all the Services, went to Divine Liturgy every morning, helped the sisters in the garden, in the kitchen, and in the candle-making workshop, and even learned to make prayer ropes. There I learned some Russian and Church Slavonic. There, the desire to become a nun unnoticeably ripened within me. Having been founded in the Netherlands by the Dutch and for the Dutch, the convent in The Hague had its own “flavour,” unlike what one would find in a traditionally Orthodox country. This difference led Mother Maria to a new search—for traditional monasticism. 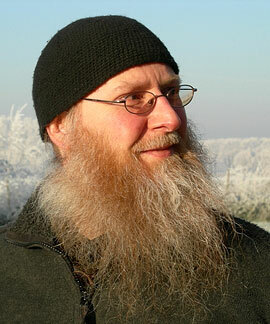 “As for me, I joined the monastery in The Hague because it was the only Orthodox monastery in Holland. I had only one, simple thought: if God has seen fit to call me, a Dutch girl, to monasticism, then it should be in a monastery in Holland. Looking back, I can say that this was the right decision for me, although my life went in a different direction from what I could have expected in those days. The monastic life in The Hague was very difficult for me. The idea there was to have a monastery in the center of town, so that anyone who wished could become acquainted with Orthodoxy. It was a monastery with a parish and just a few sisters, who went to work at secular jobs every day in civilian clothing, in order to earn a living. At that time several brothers also lived there, each of whom later found his own path. I remember Fr. Timothy, who reposed this year (then his name was David) having lived thirty years on Mt. Athos; also Fr. Pachomius, (also recently reposed) who founded the monastery of St. Hubert (in southern Holland); and Fr. Thomas, who founded a monastery in Belgium. In 1973, the young Dutch novice looked to Serbia for monasticism and Orthodox spirituality, and entered Zica Monastery, near Kraljevo. St. Justin Popovich, the spiritual father of the monastery of Celije, was still alive at the time, and Mother Maria remembers his prophetic words to her when she went to receive his blessing. He told her that she had come to Serbia to learn monasticism, but would later return to Holland. As a Dutch citizen, Mother Maria was not free to remain indefinitely in communist Yugoslavia, so she heeded the elders’ advice, and in 1975 went to Greece. Mother Maria lived in a monastery in the Peloponnesus, near Sparta, where she received the monastic tonsure. Meanwhile, she made great progress in her study of the Greek language. In 1982, she visited Holland again for the first time in years, where her Orthodox friends persuaded her to open a convent in her native land. She returned to Greece in order to prepare herself for this undertaking. Mother Maria settled temporarily in a monastery of the diocese of Drama, in the north of Greece, and took a course at the University of Thessalonica on the translation of liturgical texts, taught by the late Professor I. Fountoulis. The time was approaching when she would be leaving Greece, her home of eleven years, in order to help nurture the growth of Orthodoxy in Western Europe. “I, myself, feel at home in a Greek monastery, but I can understand why it would not be that way for everyone. It is no wonder that new Orthodox monasteries are being opened in the West. But it is very important for such monasteries to have connections with a country which is traditionally Orthodox, and with its monasteries. “Throughout history there have been monastics who, having spent several years in Greece, returned to their homelands. Such Russian fathers as St. Anthony of the Kiev Caves and St. Nilus of Sora are examples. In recent times we could cite Fr. Placide, who became Orthodox on Mt. Athos and returned to France, where he started a monastery. Another example is an Australian of Greek origin, who became a nun in Greece in 1983, and ten years later was sent back to Australia, a country with several million Greek Orthodox, in order to establish a monastery for women. There is also Fr. Vasily (Grolimund), of Swiss-German origin, who founded a monastery in Germany after living for ten years on Mt. Athos. “The history of Elder Ephraim’s American monasteries is not much different—at the request of a number of Greek Americans, he chose a group of Greek monks and nuns to organize monasteries in America according to the Athonite rule. In less than twenty years Fr. Ephraim founded eighteen monasteries, and he hopes before he dies to found two more, so that they might be equal in number to the monasteries of Mt. Athos—twenty. Most of the abbots and abbesses of these American monasteries are Greeks, or are of Greek origin; for example, Fr. Paisius, the Abbot of the monastery in Arizona, is a Greek who was born in Canada. One of the fathers with whom Mother Maria counseled was Archimandrite Sophrony (Sakharov) of the Monastery of St. John the Forerunner in Essex, England. The first few years of her life in Asten were mostly spent alone. It took a while for sisters to come. One of the oldest sisters of the monastery came to her from the United States, and then others of Greek origin came from England. She now has two Dutch sisters. This synthesis is apparent in all aspects of the sisters’ daily life. Firmly planted upon Dutch soil, the monastery’s meals are according to Dutch customs, and the language used in daily life as well as in Church Services is Dutch, a large part of the liturgical texts having been translated by Fr. Adrian of The Hague. But English enters in here and there, and Greek is sometimes used. Mother Maria even gives instruction in the Greek language to the sisters, if they have the desire to learn it. The Dutch are generally very capable of mastering foreign languages, and Mother Maria is no exception. She has also been integrating more and more Byzantine music into the Church Services. And of course, on the monastery’s patronal feast day, the busloads of Greek immigrants are a cheerful reminder that the monastery is forming according to the Greek tradition. On a daily basis, however, the regular visitors are Dutch. Bible study classes are conducted weekly for their benefit. “Dutch people are generally attracted to Orthodoxy by its beauty—the icons, the music. They are also attracted by its stability. The Vatican II Council caused great disturbance amongst Catholics in Europe, while Orthodoxy offers an unchanging tradition. “Protestants come looking for the Church of the first centuries of Christianity, which is, of course, Orthodoxy’s claim. Many people come through personal contacts, and through reading books. Bishop Kallistos Ware’s book, The Orthodox Church, did much for Orthodoxy in Europe, as well as the writings of Vladyka Anthony Bloom, and Fr. Sophrony. Naturally, nowadays very many people are becoming Orthodox through mixed marriages. The Asten convent is also visited by members of the “new” immigration from formerly communist countries, who are now becoming parishioners in local Orthodox churches, where there are many Dutch converts. The immigrants are learning to live in a very different society. “If there is good communication, this can make for a good combination—in theory, anyway. It is a challenge—God’s challenge. As far as infrastructure and activities are concerned, however, the Coptic Church is better organized here than the Orthodox. There has been talk in the past of organizing a “Dutch Orthodox Church,” but Mother Maria believes it is too early. This brings us back to the little chapel on the road outside the convent, which “came by itself” in an unlikely manner. Here is how it happened. A certain Dutch artist in the area had an original idea: art along the highway. He received permission from the highway authorities to construct some objects of art at rest stops along the main thoroughfares of Holland. In order to decide upon just what he should construct, he took a survey of the category of driver who most often passed through these parts. The main category at a certain rest stop just happened to be Russian auto dealers, and he asked them what they would like to see. The answer was — a little chapel. The artist did his research on the subject, and a wooden structure was built, a chapel dedicated to the Mother of God, Hodigitria, or “She who shows the Way,” complete with an icon on the inside, and a prayer for travelers printed on the wall in both Dutch and Church Slavonic. Now, the highway authorities had consented to a temporary exhibit, and not a permanent fixture, so the chapel had to be removed. 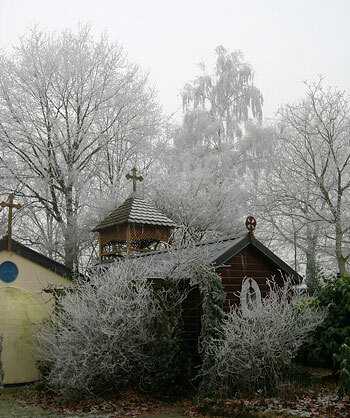 Fortunately, someone told them about the “Orthodox Klooster” in Asten, and they called Mother Maria. She happily consented to take the chapel. Yes, the date was… and then she remembered. The date of arrival was the feast of the icon of the Mother of God, Hodigitria! She cancelled her call instead, not daring to obstruct God’s Providence and the good will of the Mother of God herself. With thanks to Tatiana Panchenko of the St. Nicholas Orthodox Church in Amsterdam. The Convent of the Lesna Mother of God, in Provemont, near Paris, was formed by Russian emigrant nuns from what is now eastern Poland. It has been a revered place of pilgrimage for the Russian Church in Exile. The Kolivades was a movement which arose on Mt. Athos during the mid-18th century as a reaction to the decline in monastic life.